BrainFizz - Routing, Making, Custom projects & Training. 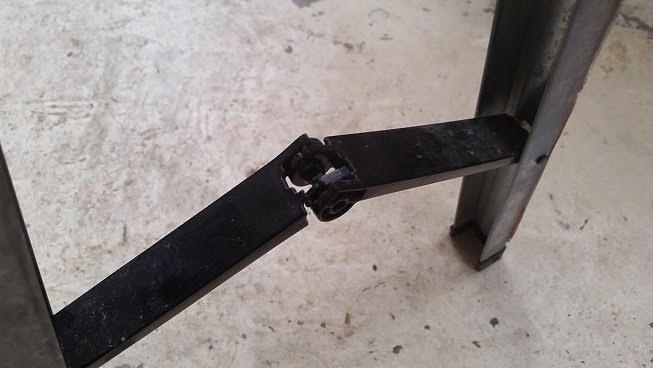 : 3 solid reasons why not to waste your money on stanley fold-up saw horses. As you can see, they've been used. 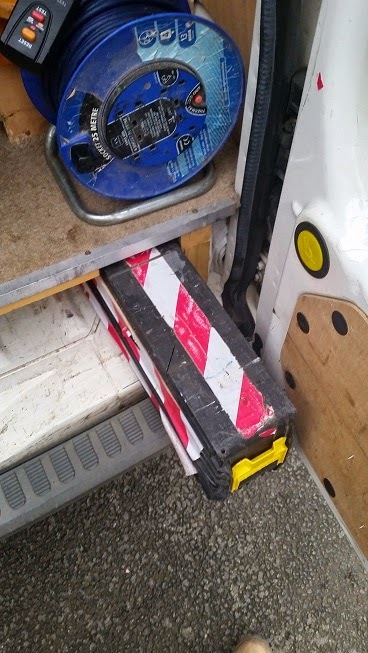 I added the red/white tape to them last summer and used them as barriers to work behind to stop access from passers by. Definitely the best feature is the fact that they fold up and clip together for transportation - In fact stanley even supply a shoulder strap to carry them both with. I never actually used this strap, as I found them awkward to carry in this way, and the built-in handles are really comfortable. This however is where the plus points stop, and things start to unravel for the more practically minded sensible shopper. broken leg supports, after first time in use. The first time I unfolded the saw horses, literally within an hour of spending around £50 for the pair the plastic folding supports that stop the legs flapping about and collapsing when you move them snapped. The plastic they are made from is really hard, the sort that shears off and snaps with a high pitched "twang!" when it fails, leaving a razor sharp edge. In hindsight I should have seen it as an omen, and taken them back for replacement. but they were needed there and then, and it still did the job so I lived with it, which then lead to far too much time having passed, to return it. I wasn't bothered really as they still functioned. In fact I'm still not bothered now, as they still do function all this time after. 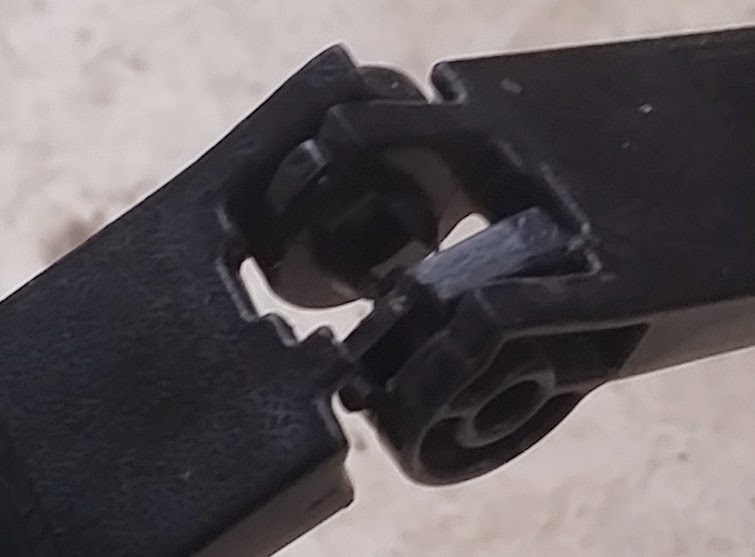 This piece snapped because the fitting of the two parts is too tight to allow it to rotate when folding. About a month ago I was working on a refurb of a whole load of oak windows and doors, sanding down and re finishing. Some oak panels had been removed from under a window, and then needed sanding back. 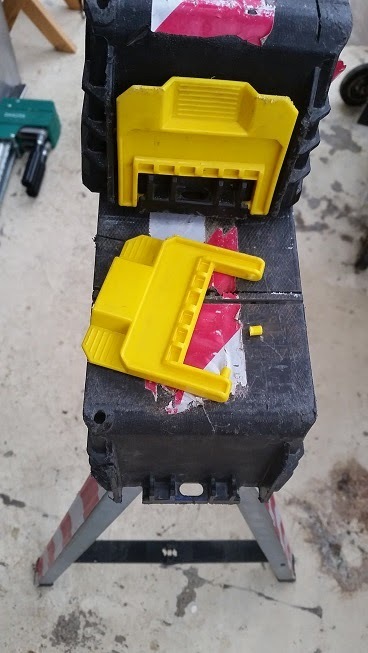 I took the saw horses out of the van to lay the panels on them and one of the yellow clips that holds the two together during transit snapped, so when I got them out to carry them across the yard to the window there was a loud clatter and they fell apart! When you buy them they look really well made, and robust. In fact if you look at the reviews of them in places like screwfix and even the stanley website they all pretty much say the same "pricey, but worth it due to build quality". There was a time I would have agreed, but after contacting Stanley tools, the story gets even worse, as they didn't even bother replying at first. I waited about a month after first contacting them, before tweeting publically that I was disappointed at never getting a response from them, within about an hour they had replied apologetically, followed me then asked for me to message them my contact details, which I did there and then. 4 days later I had to chase again for an answer to getting hold of the parts to fix the item, and got told "because of the low cost of the item, they are not available as spares, sorry for the inconvenience"
Now I'm going to gloss over the diabolical customer service, and the fact I've had to chase them each time for a response this last month or more and head straight to the point about "low cost of the item"
all of which relies on a small plastic clip to function - YET YOU DON'T MAKE THAT PIECE AVAILABLE AS A SPARE PART??? If you are in the market for a set of folding saw horses, I would seriously consider NOT having these! up to this point I would have looked at stanley as a contender in the trusted tool names arena, however purely from the point of view of "customer service" I will no longer be looking to them in the future for solutions, Nor supporting their company in terms of future purchases. I can actually live with items having a finite life, even the fact that you get the odd "5 O'clock Friday" product, but having to chase someone for 5 weeks or so just be told "Sorry, nothing we can do" is a step too far in my book. I'm actually quite disappointed, as I would have expected more from a company such as this this. I would be interested to hear from anyone who's either dealt with stanleys after sales, or who has a set of these saw horses. Or anyone who can offer a different sawhorse solution. I'm currently looking at the Piher saw horses, as these are metal, they fold away, and I know for a fact their customer service is excellant!